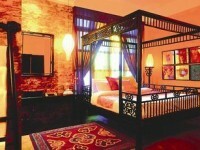 You can enhance your experience of the East even more if you are staying in an Eastern themed hotel as well. 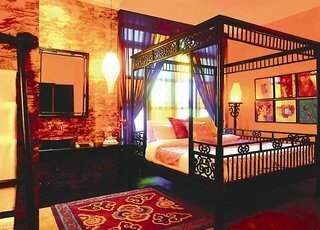 The Shanghai Mansion Bangkok would be perfect for this as you would stay in the Thai capital at a hotel inspired by Chinese art and culture. We have just found out that there are rooms on sale at the 4 star boutique hotel, from $67 a night, so you should hurry and book before the best ones sell out! 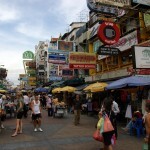 Exotically, the hotel can be found right in the heart of Bangkok’s Chinatown, on the Yaowarat Road. 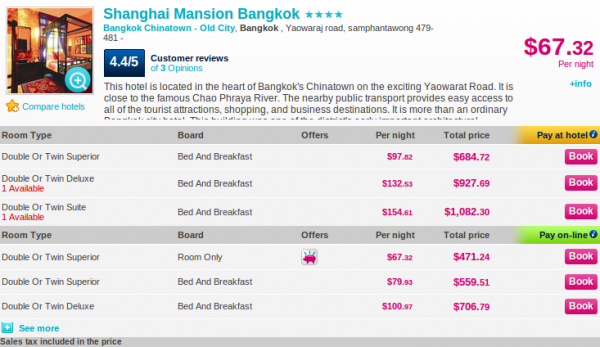 Rooms have free Internet access and Shanghai Mansion bangkok has got its own bar and restaurant as well.This hotel deal can be booked on Hotelopia, so that is where you should start your search. Still, others might have even better rates that we have missed, so check the other merchants as well. We took a screenshot of the Bangkok hotel deal so you can find it easier on the site and so you can check all the details you wanted to know. 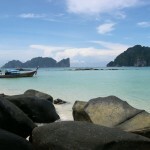 We have checked the prices for a 7 nights period in late September and the best we have found was a $67 a night Double or Twin Superior Room. Take a look at the other room prices and you will also see that rooms are generally a lot cheaper if you pay for them online. 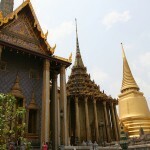 Choose a room and have an amazing Bangkok getaway!